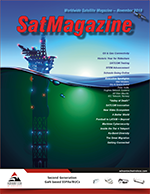 The Satellite Industry Association (SIA) has announced that Globalstar, Inc. (Globalstar) is the latest company to join SIA. Globalstar operates a LEO constellation of satellites and provides mobile satellite voice and data products and service packages to government, industry and consumer customers around the world. 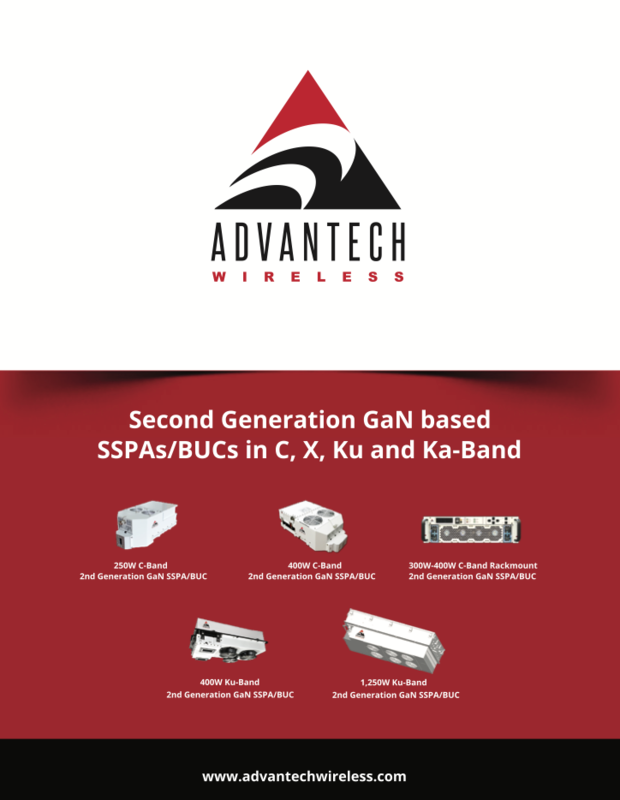 The Company’s products include mobile and fixed satellite telephones, the Sat-Fi satellite hotspot, Simplex and Duplex satellite data modems, tracking devices plus its subsidiary SPOT LLC family of consumer satellite products. In September, Globalstar announced the appointments of Dave Kagan to the position of CEO and Jay Monroe to Executive Chairman of the Company’s Board of Directors and earlier this year the Company introduced two new products, SmartOne Solar and the SPOT X 2-way satellite messenger. Arianespace marked another mission accomplished for science tonight as the company’s heavylift Ariane 5 successfully sent BepiColombo — Europe’s historic first mission to Mercury, organized in cooperation with Japan — toward the solar system’s smallest and least-explored terrestrial planet. Mercury. Photo is courtesy of Arianespace. Ascending from the Spaceport’s ELA-3 launch complex at 10:45:28 p.m. local time in French Guiana — the planned precise moment of liftoff — Ariane 5 lofted its passenger during a flight lasting just under 27 minutes, with the multi-segment BepiColombo spacecraft deployed into an Earth escape orbit. Mercury also is known as the “Swift Planet” because its orbital period around the Sun of 87.97 days is the shortest of all the planets in the solar system. The BepiColombo mission is being carried out jointly by the European Space Agency (ESA) and the Japan Aerospace Exploration Agency (JAXA). After arriving in late 2025, the spacecraft — built under the industrial leadership of Airbus — will examine the peculiarities of Mercury’s internal structure and magnetic field generation, as well as how the planet interacts with the sun and solar wind. With a liftoff mass calculated at 4,081 kg., BepiColombo consists of two orbiters: the Mercury Magnetospheric Orbiter (MMO) and the Mercury Planetary Orbiter (MPO); as well as two additional elements: the Mercury Transfer Module (MTM), and the Magnetospheric Orbiter Sunshield and Interface Structure (MOSIF). 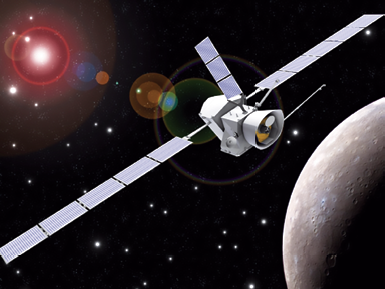 BepiColombo is scheduled for a one-year nominal mission at Mercury, with the possibility for a one-year extension. It was named after Italian mathematician and engineer Giuseppe “Bepi” Colombo, who was known for his work related to Mercury. 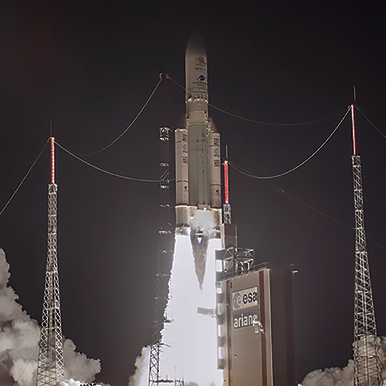 The Ariane 5 launch — designated Flight VA245 — was the 23rd major scientific mission performed by an Arianespace family vehicle to date, following deployments of such high-profile passengers as Rosetta, the Mars Express and Venus Express space probes, Gaia, Herschel, Planck and Aeolus. It also underscores Arianespace’s primary objective to guarantee Europe’s independent and reliable access to space. BepiColombo is the 51st mission (and 73rd spacecraft) launched by Arianespace for ESA and is also the 121st Airbus-produced spacecraft lofted by Arianespace, which has a backlog of 22 additional satellites to orbit for this manufacturer on future flights. As Arianespace’s seventh launch of 2018, Flight VA245 follows other heavy-lift Ariane 5 missions performed this year on January 25 (carrying SES-14 and Al Yah 3), April 5 (DSN-1/Superbird-8 and HYLAS 4), July 25 (four Galileo satellites) and September 25 (Horizons 3e and Azerspace-2/Intelsat 38). Also conducted earlier in 2018 was Arianespace’s medium-lift Soyuz mission on March 9 (with four O3b satellites); plus a light-lift Vega flight performed August 22 (Aeolus). November as the timing for the company’s next flight, which will use a Soyuz launcher to orbit Europe’s Metop-C polar-orbiting meteorological satellite for the EUMETSAT satellite agency. Artistic rendition of the BepiColombo spacecraft. Image is courtesy of CNES. In post-launch comments from the Spaceport, Arianespace Chief Executive Officer Stéphane Israël congratulated ESA and JAXA and underscored his company’s continuing contributions to space research and science at the service of such institutions. Israël then added that Arianespace’s latest Ariane 5 launch was special due to the spacecraft’s Earth escape flight profile, and that such would not have been possible without the European launcher's ‘dream team’. This launch showed the versatility of Ariane 5 and double congratulations are in order for all of the partners for this new success. Guenther Hasinger, the ESA Director of Science, stated that the firm is standing on the shoulders of giants, and the giants are all of you [the participating companies]. He also thanked Arianespace for Ariane 5’s exact on-time liftoff and the spacecraft’s accurate deployment. JAXA Senior Vice President Shizuo Yamamoto highlighted the excellent cooperation at the Spaceport launch site of Arianespace, ESA, the CNES French agency and the industrial teams that contributed to sending BepiColombo on its way to Mercury. The BepiColombo satellite built by Airbus for the European Space Agency (ESA) and Japanese Space Agency (JAXA) has embarked on the spacecraft’s long journey of some 8.5 billion kilometers through the inner solar system, reaching our solar system’s innermost planet in seven years. After arrival in 2025, for the first time two space probes will simultaneously observe Mercury and its environment. Plans include using cameras to map the planet’s surface more precisely than ever before. Data collected from 16 scientific instruments will provide insights into the geological and chemical composition of the planet, along with its structure, the characteristics of its magnetic field and interaction with the solar wind. The Ariane 5 launched ‘Bepi’ into space at ‘escape velocity’ — the speed required for an object to break free of the Earth’s gravitational pull. This will allow the space probe to enter a solar orbit similar to that of the Earth at speeds of around 120,000 km/h. During its journey to Mercury, BepiColombo will make several braking maneuvers to adjust its orbit, allowing it to make a slow approach towards the planet. In order to achieve this, the control center — the European Space Operations Centre (ESOC) in Darmstadt, Germany — has plotted a sophisticated course through the inner solar system. of Airbus Defence and Space. The spacecraft’s “brakes” will be applied just 60 days into the journey to reduce Bepi’s speed: an electric propulsion system and a total of nine planetary swing-bys (one of the Earth in April 2020, two of Venus and six of Mercury) will provide BepiColombo with the energy it requires. A maximum of two of the four xenon-propelled ion thrusters will be employed at any one time during the long journey; these will be used on more than 700 days in total, up to four months of which without interruption. The thrusters will be powered by two 1.8 x 14-meter solar arrays. The ion thrusters, a further chemical propulsion system and the solar arrays are located on the Mercury Transfer Module (MTM), the propulsion module for the interplanetary voyage to Mercury. With the journey totaling some 8.5 billion kilometers — the equivalent of traveling from the Earth to Neptune and back again — Bepi will actually travel 38 times the maximum distance between the Earth and Mercury. After traveling for seven years and completing 18 orbits around the Sun, the MTM will be jettisoned in 2025. From that point onwards, the orbiters will power themselves using solar energy and their own propulsion system. The space probe will then swing into orbit around Mercury before each orbiter enters its own orbit and begins the actual scientific exploration of the planet. 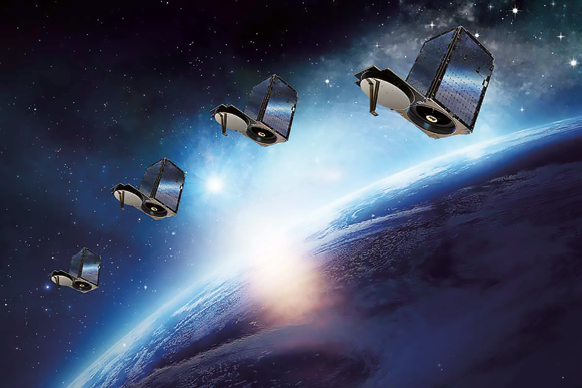 SSL, a Maxar Technologies company (NYSE: MAXR) (TSX: MAXR, has shipped two Earth Observation (EO) satellites to Vandenberg Air Force Base where they will be launched on Spaceflight’s first Sun Synchronous dedicated rideshare mission aboard a SpaceX Falcon 9 launch vehicle. facility. Image is courtesy of SSL. 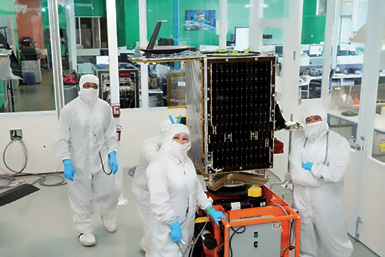 SSL manufactured SkySat 14 and 15 for commercial EO company Planet, advancing SSL’s leadership in the manufacture of innovative, small form-factor satellites. The imaging satellites feature 72 cm. resolution and will be added to Planet’s SkySat constellation, which currently includes 11 SSL-built smallsats. The SkySat constellation complements Planet’s Dove constellation, with the most satellites on orbit from a commercial imagery provider. Dario Zamarian, Group President, SSL, said that the company continues to embrace innovation and elevate partnerships to meet the rising demand for small form-factor satellites. This has been rewarding to apply SSL’s extensive expertise in the manufacturing of high-quality small satellites, solidifying the firm’s leadership position and supporting the Planet team in achieving their objectives. Chester Gillmore,VP of Manufacturing at Planet, noted that working alongside SSL on the company’s Earth imaging fleet has been very successful. Adding two more SkySats to Planet’s fleet will enhance daily monitoring to help customers gain valuable insights, understand what’s happening on the ground and take needed and timely action. Orolia has prepared a record nine search and rescue systems across five continents for commissioning through the Global Cospas-Sarsat Satellite Search and Rescue System. Orolia has been leading the development of global search and rescue programs for nearly 30 years, reaching a major milestone with the world’s first operational Medium-altitude Earth Orbit Search and Rescue (MEOSAR) system in 2011, and completing all global MEOSAR system installations ever since. 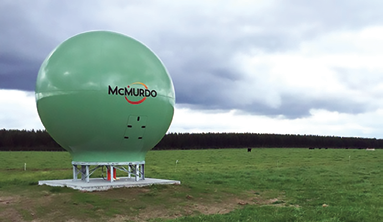 To date, 75 percent of the Earth’s surface is monitored by Orolia’s MEOSAR systems. This year, Orolia has prepared a record nine global search and rescue systems for commissioning across five continents, which include five ground-based Local User Terminals (LUTs) and four Mission Control Centers. These new, lifesaving search and rescue systems are in line to be commissioned in North America, Australia, Europe, Asia and Africa. Through its McMurdo subsidiary, the most trusted name in emergency readiness and response and the world leader in the design, development and installation of search and rescue ground-based infrastructure, Orolia has equipped these systems with the very latest search and rescue technology to increase response times and save more lives worldwide. Orolia’s VP, Satellite Search and Rescue Systems, Paul Zweers, noted that at Orolia, the company is proud to achieve a new milestone in the decades of technology innovation that the firm has brought to global search and rescue operations. 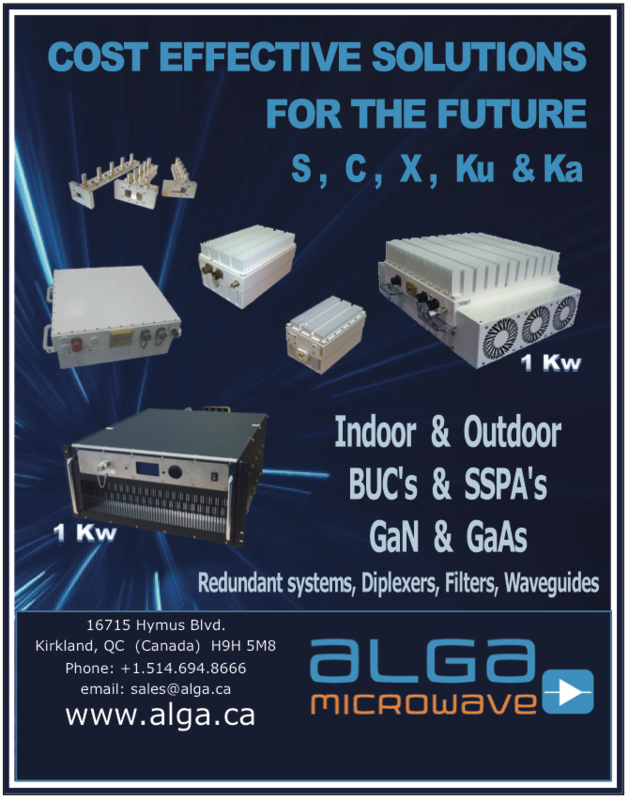 Orolia is the leading manufacturer to commission next-gen MEOSAR systems and this record number of global systems in line for commissioning reflects the company’s ongoing commitment to delivering critical technology solutions, anywhere in the world. CNES teams have achieved a first with the innovative passive de-orbiting of the Microscope satellite (MICROSatellite à trainée Compensée pour l’Observation du Principe d’Equivalence) after its two-year science mission and six months of valuable technology experiments. Microscope’s mission has come to an end with the depletion of the nitrogen fuel reserves needed for the satellite’s precise control microthrusters. Without this fuel for its drag-compensation system, the satellite is no longer able to deliver science data. Operations to passively de-orbit Microscope without expending fuel, performed by teams at the Toulouse Space Center since the start of this week, have proved especially innovative. They began by passivating the satellite to make it safe for de-orbiting and ensure that no source of chemical, pneumatic or electrical energy will pollute outer space. The next key step in the sequence involved deployment of IDEAS (Innovative DEorbiting Aerobrake System), a system designed by CNES consisting of two 4.5 meter inflatable booms wrapped in membranes to increase the satellite’s atmospheric drag surface area. It is the use of these booms in the real-life conditions of space that makes this passive de-orbiting sequence particularly innovative and unique. Thanks to this system, Microscope should re-enter and burn up in Earth’s atmosphere in approximately 25 years’ time, as required by the French Space Operations Act (FSOA) effective since 2008.The estimated time it would have taken Microscope to re-enter the atmosphere had the IDEAS system not been used was 73 years. Microscope is, therefore, the first operational satellite to be de-orbited in this manner. 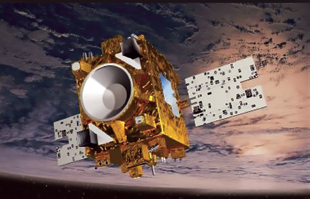 The satellite’s retirement from service illustrates CNES’s commitment to mitigating pollution and the proliferation of space debris in LEO. After the success of this delicate de-orbiting phase, CNES President Jean-Yves Le Gall commented that CNES’s teams have again demonstrated their know-how and expertise in passively de-orbiting Microscope, which is a truly remarkable feat. It follows this mission’s unprecedented scientific success in applying an innovative operational technology to verify the equivalence principle. The Microscope science teams are continuing to analyze all of the data collected by the mission and their results are expected at the end of next year.